This recipe for vanilla mojitos comes courtesy of my Aunt Jill. 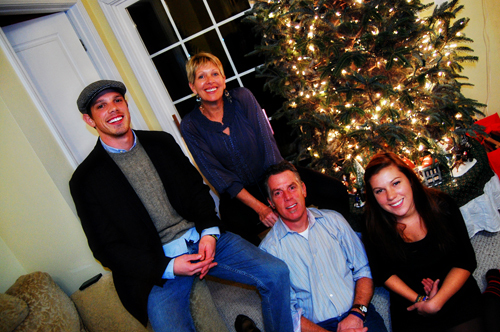 Jill, my mother’s older sister, is a wonderful person, a caring aunt, and a huge supporter of this blog. She’s the first to recommend recipes (she helped me think this one out), always tells me what she thinks of my dishes, and never fails to encourage and cheer me on. She’s incredibly special and important to me, and this Mother’s Day I’d like to give her a big virtual hug. Aunt Jill, not a particularly big rum fan, dreamed up this mojito recipe. Now Dan and I are very fond of the classic mojito, so we were skeptical. I wasn’t sure if vanilla would make sense with the lime and mint, and if I would be okay giving up rum for vodka. We decided to do a side-by-side taste testing, one version made with vanilla vodka and the other made with rum + vanilla extract. The verdict? Both are wonderful. The vodka is subtle and very refreshing, perfect for a picnic. I have every intention of enjoying some of these when we make our way up to New Jersey this summer to visit Aunt Jill. 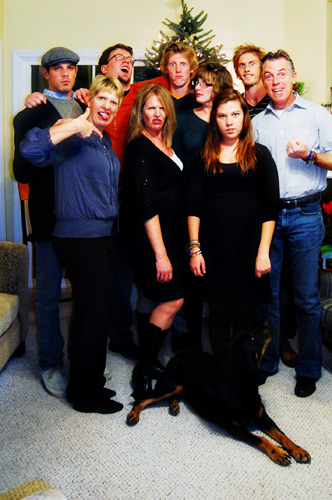 Christmas in our family. Note, please, both my Aunt Jill and my Mom (front row left and first in). This is why I’m the way I am. Also, Jessie’s total deadpan kills me. Slice two limes. 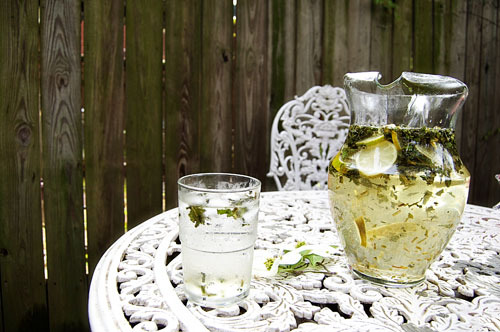 Muddle them with a handful of mint leaves in the bottom of a pitcher. Combine 1 cup lime simple syrup and 1 cup of vanilla vodka. Chill. When you arrive at your picnic destination, add 16 oz of club soda to the pitcher and serve! Slice two limes. 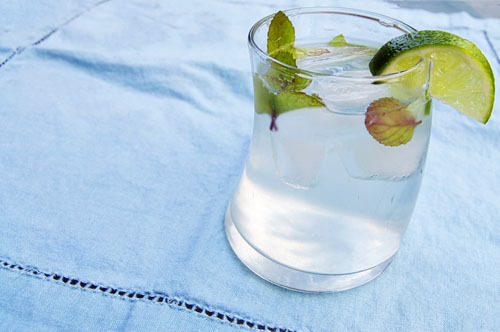 Muddle them with a handful of mint leaves in the bottom of a pitcher. Combine 1 cup lime & vanilla simple syrup and 1 cup of white rum. Chill. When you arrive at your picnic destination, add 16 oz of club soda to the pitcher and serve! Combine all ingredients in a medium pan. Boil until sugar dissolves. Cool. I’ve always loved driving the stretch between Durham and Morehead, just me and my dad. It’s the best time to talk to anyone, just the two of you alone in the car. Those drives are how I got to know my dad as a person and one of the reasons we’re so close today. The first memory I have of my dad pouring a packet of salted peanuts into a bottle of coke was from one of those drives. I remember the horror at the idea and then, shortly thereafter, the the complete change of heart I had when he let me try it. 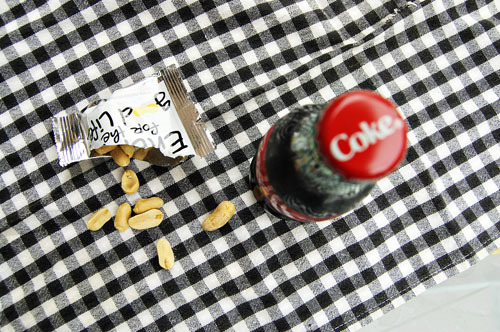 Coke and peanuts is one of those distinctly Southern combinations whose origins are unknown. It’s a curiosity (not unlike boiled peanuts or a tendency to put mayonnaise on damn near anything) that people outside the South ask about. 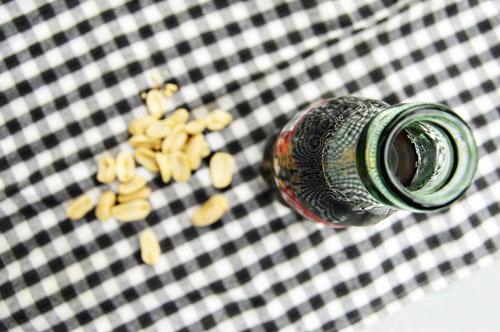 They say “you guys don’t really put peanuts in your coke, do you?” We do. And you should try it, take the leap of delicious faith. Last week the National Peanut Board emailed me to see if I’d like to be part of a mailing they were targeting towards Southern writers. I said yes and in my head, expecting them to send me a package full of peanuts, decided I’d finally post about Coke + Peanuts. It’s a bit of a blasphemy to have a Southern food blog and not have something about this salty combo on there, I’ve been meaning to post about it forever. It was the perfect opportunity, I thought. And then yesterday, waiting for me when I got home, was a package. I made a mental note to send a tweet asking where I could get glass Coke bottles in my area and opened the box. Inside was a glass bottle of Coke and a little packet of peanuts. It’s like they read my mind! Thanks for the delicious treat, NPB! 1 bottle Coke (or any cola), preferably glass. Never a can. 1 packet salted peanuts. I prefer a lot of peanuts. 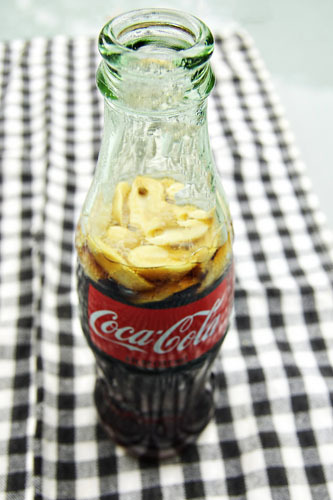 Open your soda and take a swig. 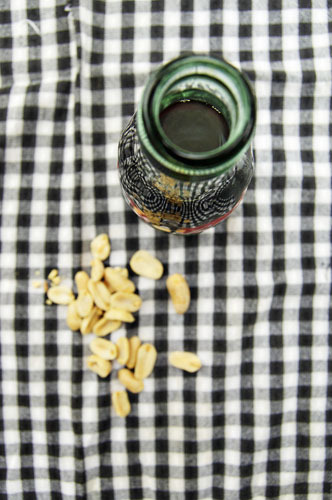 Pour peanuts into the cola and enjoy. 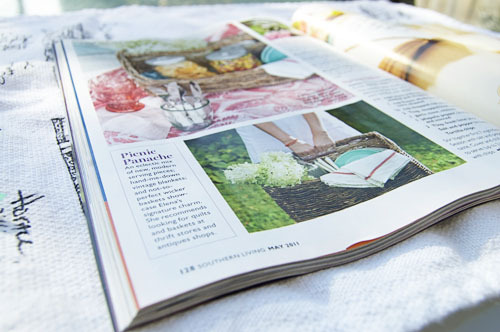 When Marian Cooper Cairns first emailed me over a year ago it was a vague email along the lines of “love your blog, do you read Southern Living?” I thought it was a scam. 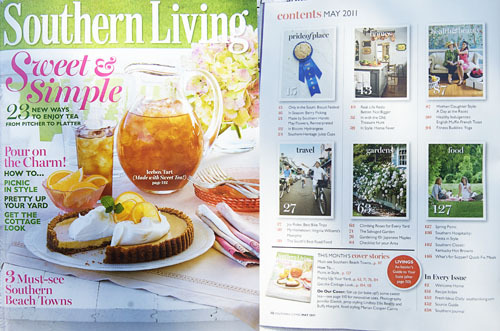 I mean, everyone I can think of in the South reads Southern Living, it’s huge. What could she possible want with me? We emailed back and forth and Marian said she’d be interested in pitching a small story about the blog. I was skeptical, but excited. That was January. By Easter, when we went home to approve my sister’s boyfriend visit with family, Marian and some coworkers had tried my caramel fried green tomatoes and asked how I felt about her idea of doing a mother’s day picnic. I talked to my mom and we decided we didn’t think it could be more perfect. 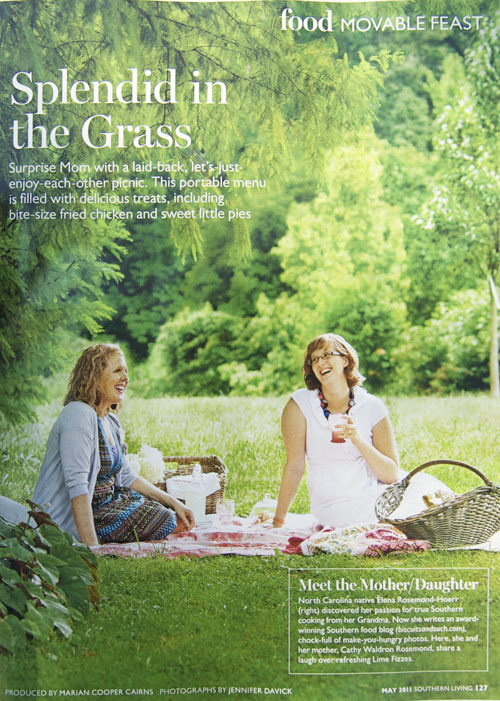 Picnics have always been an important part of our family tradition, it was a great fit for us. That spring Marian got the green light and I got to recipe developing. We decided on Fried Chicken Bites, Roasted Corn Salsa, Raspberry, Mint, & Mozzarella Skewers, Lime Fizz, and Strawberry Rhubarb Hand Pies. Marian took the recipes back to her team to test them, tweaked them to their needs, and the ball was officially rolling! We talked about location and finally settled on the beautiful Cylburn Arboretum in Baltimore. After much coordination and planning my mom, Megan, Marian, photographer Jennifer Davick, and stylist Allison Banks arrived in Baltimore in early August. The day they arrived Allison came to my apartment to pick out what we would wear for the shoot, a task that involved 1) lots of cleaning and 2) piling my entire wardrobe onto the bed. Even though she came right after lunchtime (they went to Baltimore’s Cross Street Market for a lake trout sandwich) and assured us she wasn’t hungry, my mom still made a cheese plate. A cheese plate she brought with her from North Carolina. My mother traveled 6 hours in a car with a cheese plate. Does that explain everything about me that you need to know? Probably. 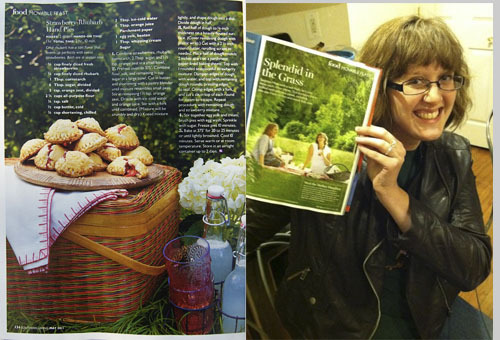 Photo on right by the wonderful Beth. After Allison styled us the team was sweet enough to take us to a nice dinner where we laughed and drank and talked about all the wonderful things about the South. Then, on a particularly rainy Friday, we met at the arboretum. As we drove to the arboretum I crossed my fingers and toes hoping that the humidity wouldn’t make my hair frizzy and that the weather would hold, a wish that mostly came true. When we arrived they had been there for hours setting the scene and photographing the food (that they made- I had to do nothing but show up and smile), and despite the fact that it had been raining on and off they had made beautiful photographs and had the sweetest picnic set up. As they photographed us we stood and sat, poured and laughed, carried pies and baskets, shook out blankets and tried not to be awkward. It was amazing and completely surreal. Since then it’s been a waiting game. Every once in a while we would get an update from Marian, letting us know that people were loving it or that it looked like it could be however many pages. The past two weeks have been the hardest, waiting for it to show up in my mailbox. Dan and I have been talking about what this would mean for months. When friends finally started getting it in their mailboxes on Thursday I thought I would die from anticipation. Finally, Friday, at a Target in Laurel, Maryland, I squealed with my friend Beth in the magazine aisle and promptly took home all three copies in stock. The feature is everything I could have hoped for. The pictures are gorgeous, the food looks perfect, and I’m 90% certain my mom and I are laughing about a “your mom” joke in the first image. Thank you so much for giving me this opportunity Marian! 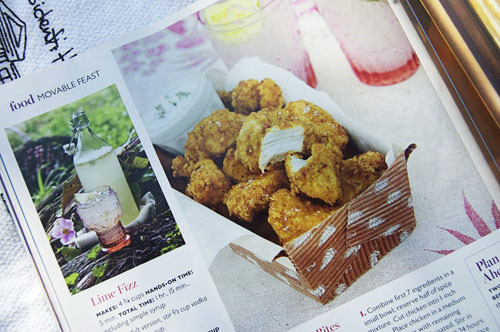 Find the Southern Living versions of our recipes here: Lime Fizz; Lime Simple Syrup; Spring Salsa; Fried Chicken Bites; Fruit, Cheese, and Herb Skewers;Strawberry-Rhubarb Handpies. See the online slideshow here. *I should note that the reason I didn’t title this post “From Scabies to Southern Living” is because it appalled my mother. But the fact that it appalled my mother is the reason I mentioned it. It’s all about balance in these mother-daughter relationships.